Yep, you read that right. It looks like one of the most requested features on Twitter (the ability to shut up annoying people), may soon be integrated into the platform’s mobile apps. According to The Verge, a select few Android and iOS Twitter users are now seeing an option to mute accounts that they follow, preventing that user’s tweets and retweets from appearing in their timeline without all of the childish drama of unfollowing or blocking them. 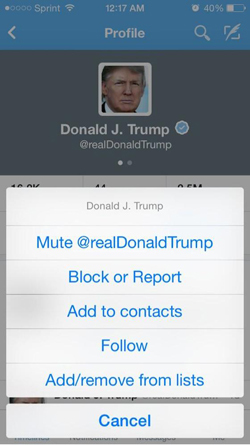 Third-party apps like Tweetdeck and Tweetbot already have very popular features that allow users to mute certain people, hashtags and activity from certain apps. Therefore, a change to Twitter’s official apps and web-based Twitter.com will presumably be welcomed by the rest of the community too.